I offer clinical supervision from my practice in Worthing. My supervision style is supportive, with a focus on encouraging curiosity, passion and positive relationships – with one’s self, with our clients and with our practice. As a business coach and owner of a therapy practice as well as my own, I can also offer practical support in setting up and running private practices following qualification and accreditation. This includes how to get started alongside other commitments and existing jobs and roles. My clinical supervision practice covers 3 broad areas : Development, Standards and Support (otherwise known as Formative, Normative and Restorative). (From Proctor’s 3 Function Interactive model 1986/1992). The Formative function of supervision is about assisting with the development of the supervisee’s practice skills, knowledge, insight and confidence. The Normative functions look to help the supervisee ensure their practice is being managed well and is safe for both counsellor/coach and client. 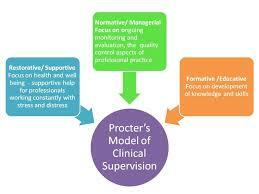 And the Restorative role looks to give encouragement and emotional balance to the supervisee. In working with a supervisee, we would decide together how best to structure our sessions based around these areas to ensure the supervisee is getting exactly what they want out of each session and our time together. This makes sure supervision is tailored for you – where you are in your training and development, the demands of your practice, and how you’d like to grow. At the end of each session we’d review how it went and carry forward the learning to the next. I hold a British Psychological Society approved certificate in Supervision. I’m also an experienced UKCP accredited psychotherapist. I trained for my 4 year Post Graduate Diploma with The Institute for Contemporary Psychotherapy in London. I work with an integrative approach based upon solution focused approaches, CBT, Relational TA, NLPt, Gestalt, Existential psychotherapy, hypnopsychotherapy and MBCT/Buddhist theory and underpinned with Person Centred core conditions. I also have an interest and training in ecopsychology and ecotherapy (taking therapy outside). As a coach I draw upon my master NLP training and personal development, line management and career coaching roles while working for a number of large companies. I’m currently providing supervision to counsellors, coaches, Victim Support Service personnel, local authority key workers and students undergoing their counselling diplomas at Worthing College. Supervision sessions are held in comfortable and modern rooms in my practice in Broadwater, Worthing. Off street parking is available and a short walk from Worthing central train station. To discuss supervision further please give me a call or drop me a line and I look forward to working together.